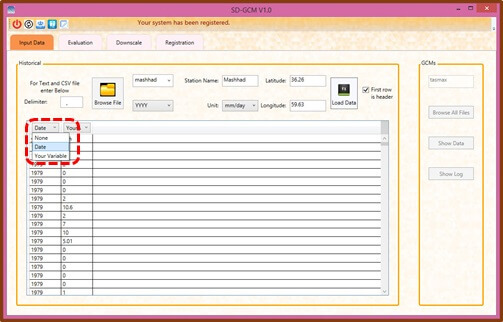 How can we run SD GCM V1.0 Tool? 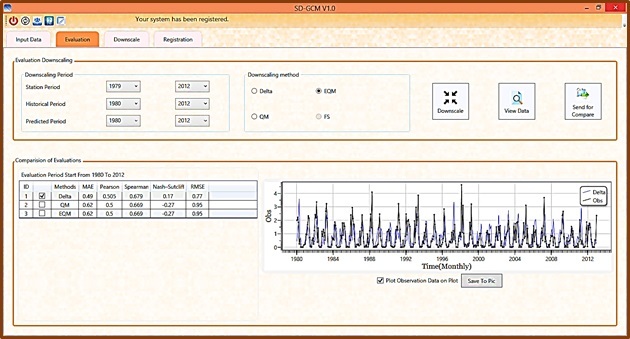 The main screen of SD GCM tool (Statistical Downscaling GCM) is presented in Fig. 2. In this screen, we have 4 tabs, namely “Input Data”, “Evaluation”, “Downscale”, and “Registration”. 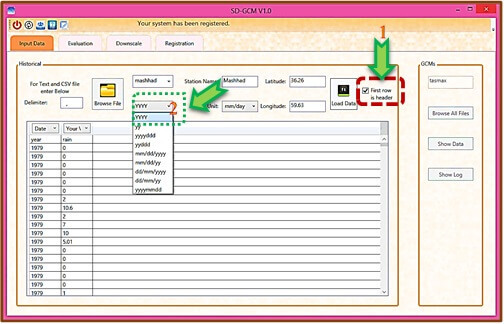 In this step, three kinds of data would be loaded, namely observation data, GCM historical data, and Prediction GCM data under RCPs scenarios. First of all, in the “Delimiter“ icon, if the input data file would be a text or csv file, then the user should write the used delimiter on that file, in the blank space, as Fig. 3 No. 1. If the input file is an excel file, the user don’t need to write delimiter. Then by clicking on the “Browse File” (Fig. 3 No. 2), the user can select the weather data of selected station. 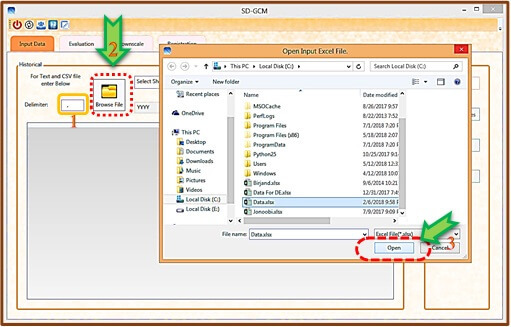 In the open window, the user browses and selects the aimed file (observation data/in-situ). As Fig. 3 No. 3, finally the user clicks on the Open button. The station data should be in daily scale. When the input file was selected, then the user needs to set some of attributes of the station data. As you see the Fig. 4 No. 1, in this phase the user needs to select the aimed sheet. By selecting the desirable input sheet, then the user should write the “Station Name” (Fig. 4 No. 2), “Latitude” (Fig. 4 No. 3), “Unit” (Fig. 4 No. 4), and “Longitude” (Fig. 4 No. 5), as following. If the input data file has header in the first row, so the user should check the “First row is header” check box (Fig. 5 No.1), if not, don’t check it. For the type of the input data’s time, the user needs to determine it, as the Fig. 5 No. 2. 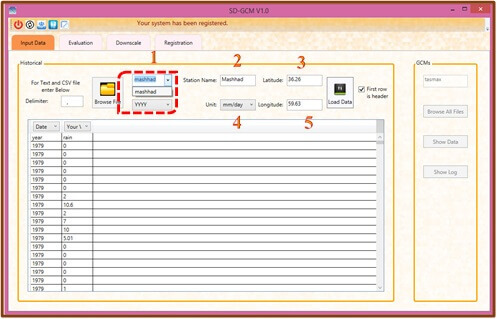 About the input data, in this phase, we need to assign the type of data, the user can assign all the kind of input columns or just select the date and for example precipitation. In this sample, here, we select the “Date” as the first column (Fig. 6), and the precipitation (rain) as the fourth column (Fig. 7 No. 1). Finally, in this step the user can would select the “Load Data” button (Fig. 7 No. 2). 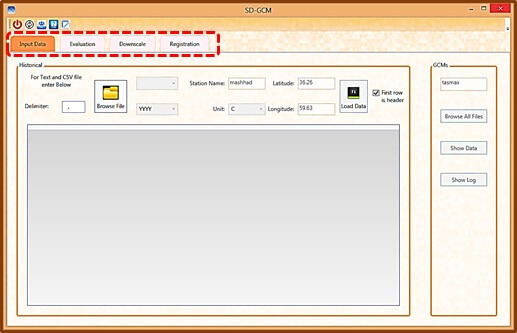 The second main tab in the Statistical Downscaling GCM (SD GCM) tool is “Evaluation” tab. 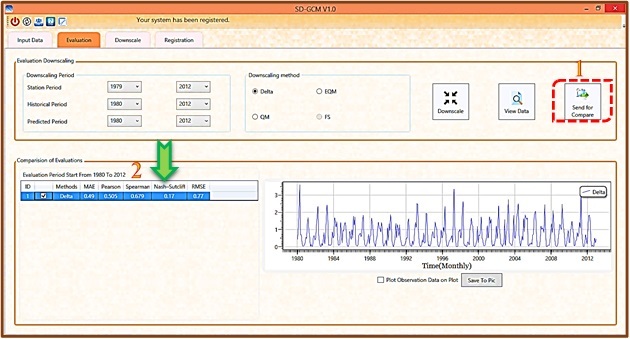 In this tab we can assess the performance of statistical downscaling methods during the common period. According to the Fig. 10 No.1, in the “Evaluation Downscaling” panel, we should set three different periods of time, namely “Station Period”, “Historical Period”, and “Predicted Period”. Be careful to filling the times and selecting the proper year from the combo box. In Fig. 10 No.2, you can see them. 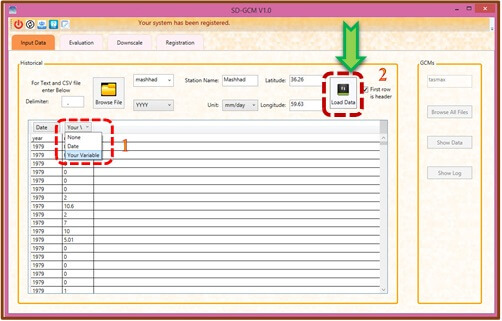 For the “Station Period”, it is exactly the first file of the case study station that you have browsed it in the “Input Data” tab, and the start and end time of it, are equal to the observation time. In this sample, start time of the station data is started 1979 and the end is equal to 2017. For the “Historical Period”, it refers to historical GCM data. As we know the start and the end of this data are depend on the used model of GCM. For example some of the models have a period of 1950-2010, or 1950-2012, or may be another one. So, in SD GCM you can select a common base according to the same period of station and historical data. In this sample, we have selected the 2012 as the end year for the evaluation period, see Fig. 10 No. 2 and Fig. 11. As well, for the “Predicted Period” (Fig. 12 No.1), we have selected 2012 for the end year in the predicted period. In the panel of “Downscaling Method”, as you can see there are 4 methods of statistical downscaling that three of them are active, and the user can apply them, namely Delta, QM, and EQM methods. The equations and all of the details for these methods are presented in the “Overview” file. For the first example as you see in Fig. 12 No. 2, the Delta method is selected for statistical downscaling method. 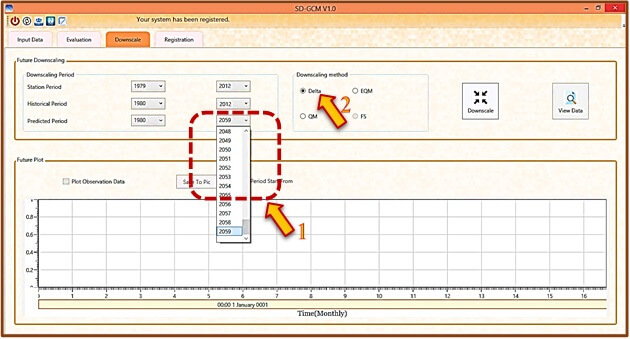 When the periods and the statistical downscaling method is selected, then by clicking “Downscale” button, the statistical method would performed on the data, during selected period by user (Fig. 12 No. 3). When the data was downscaled correctly you can see a message box, as Fig. 13 No. 3, by clicking the OK message, then your data were downscaled. If you clicking on the “View Data”, you can see your evaluation data and save them as an excel file. In Fig. 14 No. 1, by clicking on the “Send for Compare” button, you can observe the result of efficiency criteria’s. In the “Comparison of Evaluations” panel (Fig. 14 No. 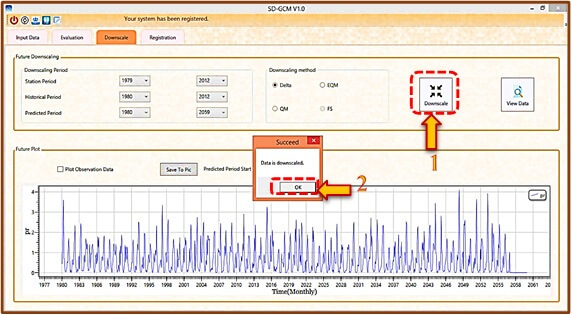 2), the user can achieve 5 methods of efficiency criteria's, between observation and historical data for knowing that does GCM model has generated proper data in compare to observation data? These efficiency criteria are RMSE, MAE, Spearman, Pearson, Index of Agreement, Nash Sutcliffe model. By considering the result of efficiency criteria's, the user can make a decision. In Fig. 15 No. 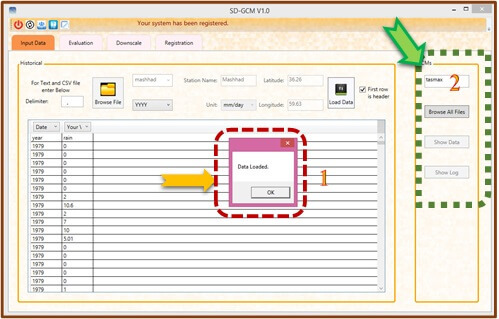 1, the user can see the whole period of common base for evaluation process in the top of efficiency criteria table. In Fig. 15 No. 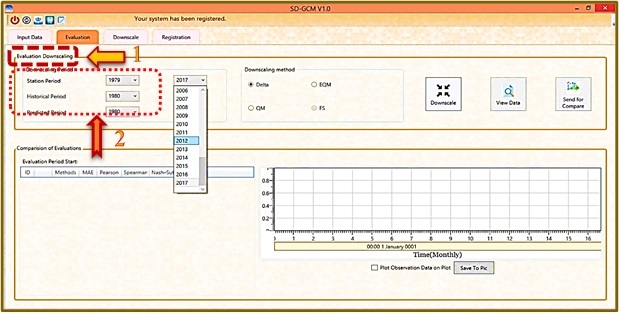 2, the user can check on the box which is asked about plotting the observation period on the table or no. There is a legend box on the graph (Fig. 15 No. 3), which is represent the used signs for Delta (historical period) and observation data as Obs. 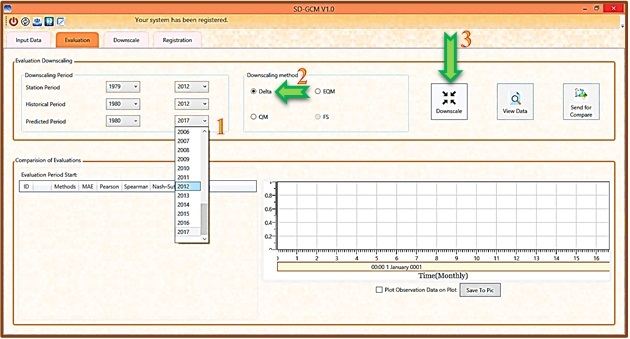 In the third step, the user can start downscaling method for future data under selected RCPs scenarios. In this phase, similar to the evaluation step, the user needs to assign three periods of time, namely station, historical and predicted data. According to the Fig. 16 and Fig. 17 No. 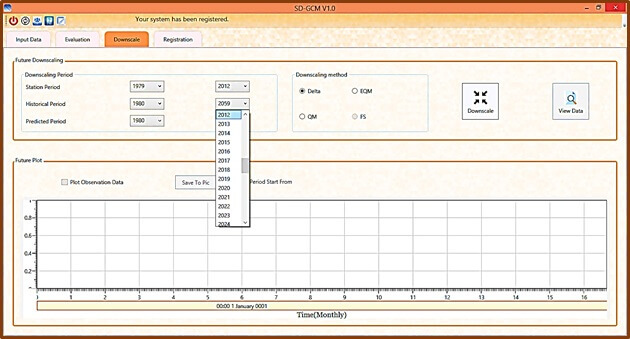 1, the user can select the desired year manually, for downscaling future data. As Fig. 17 No. 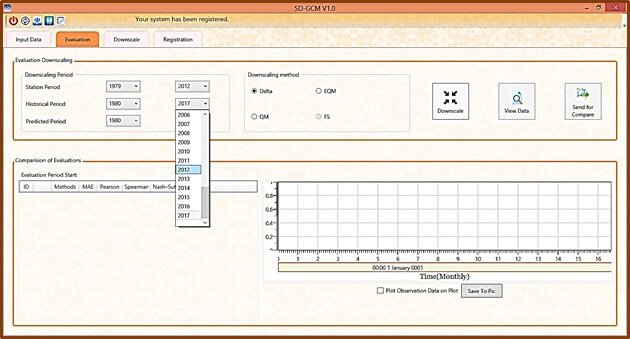 2 shows, the user can select one of the statistical downscaling method in this panel. Since, in the evaluation period, the Delta method was selected, so it is reasonable to select Delta method in this step. By clicking the “Downscale” button (Fig. 17 No. 1), the user faces to a message box (Fig. 18 No. 2), which is showed downscaling process was done. In the “Future plot” panel, by checking the “Plot Observation Data” box (Fig. 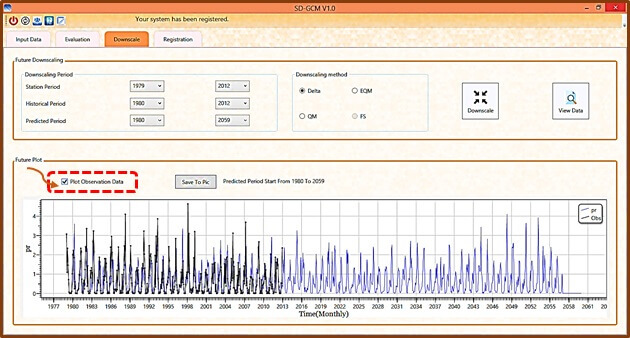 19), the user can observe the time series of observation data in the graph. The graph which is located in the bellow of Fig. 19, is the final graph of the future data. Fig. 20 shows the results of EQM statistical downscaling method. 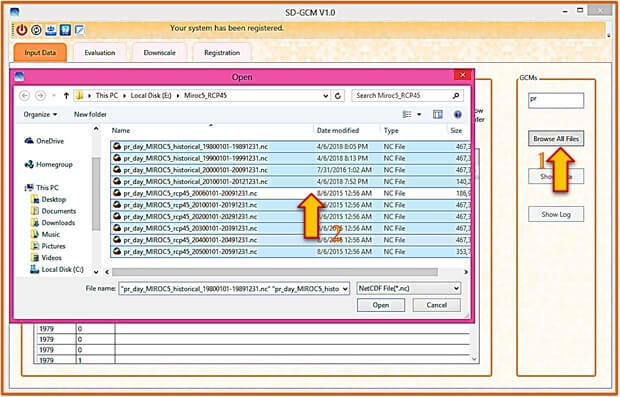 The SD GCM version 1.0 tool can downscale all the CMIP5 models except 2 or three such as HadGEM. 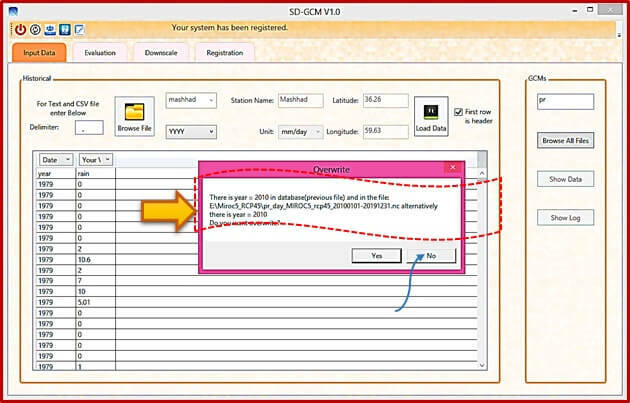 It's due to this model was developed according to calendar with the 360-days, if a customer wants to use such models, he/she can make a request to Agrimetsoft, and then Agrimetsoft can add it to SD GCM. All the input files for GCM models should be in daily scale, as well the station data of the case study has daily scale. The format of CMIP5 models are in nc (NetCDF) format file. 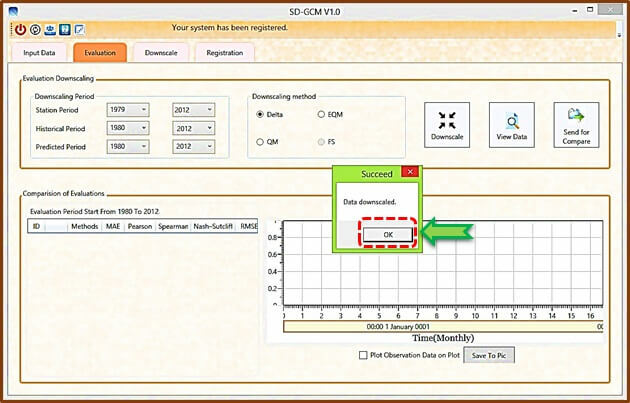 With the unregistered version of SD GCM, you can evaluate the methods( Delta, QM, and EQM) but you can not save the result data. 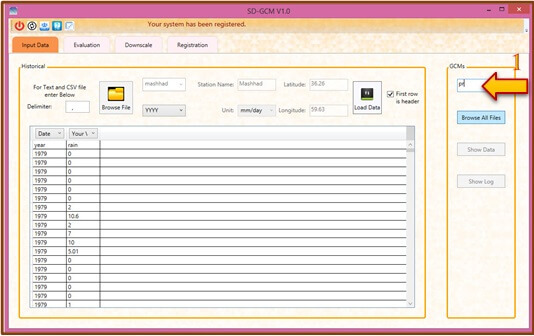 For complete using of SD GCM, you should buy a license key. You should load the GCM data continuously.